SEOUL ’Oct.3　Nikkei Asian Review) -- Baseball is the leading sport in South Korea, but the game is battling a series of financial scandals amid worries that its popularity has peaked. Rebuilding the national team as it prepares for the 2020 Tokyo Olympics is seen as crucial for the sport's future. South Korea won the last Olympic baseball gold medal in Beijing in 2008. But the sport was not included in the games in 2012 and 2016, and South Korea is now desperate to repeat the feat in Japan. In order to improve its chances, the Korea Baseball Organization, which oversees the game, handed the head coaching job full-time to Sun Dong-yeul on a three-year contract in July. Sun has coached the Kia Tigers and Samsung Lions in South Korea's professional league, but is best known for his exploits as a player. Regarded as perhaps the best pitcher the country has produced, the 54-year-old was named KBO League Most Valuable Player three times, and won the Korean Series, the country's top tournament, on six occasions. Sun retired as a player in 1999 after four seasons with Chunichi Dragons, in Japan. His first test as national team coach comes in Tokyo in November. 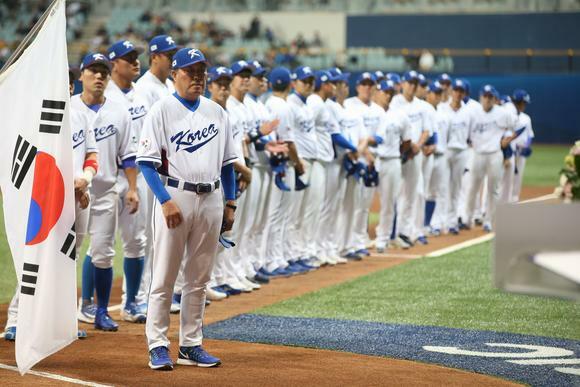 The Asia Professional Baseball Challenge, a three-nation tournament that features Taiwan as well as the host nation, is a useful team-building exercise because it is restricted to players under 24 or those with less than three years' professional experience. Sun named his preliminary 42-man roster for the tournament on Aug. 28 after spending the summer meeting players and coaches from the 10 teams, financed by South Korean conglomerates such as Samsung, Kia and LG, that make up the country's professional league. "Day by day, I am meeting all the coaches," Sun said. "I have talked to them openly and honestly and they have all said that they will do what they can to help the national team." There is optimism that hiring a permanent manager will help. In the past, the KBO appointed temporary coaches, who were already working for league teams, to lead the national team for short periods through specific tournaments. Sun will be able to build a team over the medium-term. "It will help a lot in the future shaping of the national team," said Dan Kurtz, a South Korea-based American baseball writer. According to Kurtz, past appointments, with coaches remaining attached to domestic clubs, created conflicts of interest. "Since Sun is no longer employed by a KBO team, he will not have to worry about potential work-related issues and can focus solely on the national team," Kurtz said. Sun's immediate priority is to encourage the team following its first-round elimination at the World Baseball Classic, the sport's equivalent of soccer's World Cup, which was co-hosted by South Korea in March. South Korea finished runner-up in the 2009 tournament and was looking for a similarly good performance in 2017. Despite playing all three first-round games in Seoul, the hosts lost 2-1 to Israel and then 5-0 against The Netherlands, ensuring that a final group game victory over Taiwan was not enough to prevent a surprising and early exit. South Korea was unable to field some players who play professionally in the U.S., but still had a roster that was expected to do well. "Baseball is a game of inches," said Barney Yoo, KBO general secretary. "We had a good balance between old and young players, and everyone worked really hard. We had chances against Israel in the first game, but we just couldn't execute them. If we had won that first game then the rest of the series could have gone very differently." Almost as surprising as the early exit was the number of empty seats in the stadium, adding to fears that the sport's recent golden era, ushered in by the 2008 Olympics, may be over. "Winning in Beijing was a turning point of Korean baseball," said Yoo. "Baseball had lost its popularity it enjoyed in the 90s. The gold medal brought back forgotten old glories. It discovered new rising stars who became strong players in the league until today." Baseball is still the most popular domestic sports competition, ahead of soccer's K-League. But expansion from eight teams to 10 earlier in the decade has brought mixed results. KT Wiz, based in Suwon, south of Seoul, is in its third season. It finished bottom of the league in its first two seasons and is on course to collect a third successive wooden spoon. By mid-August attendances in the league were down about 2% from the previous year, despite the long-awaited return to the top of Kia Tigers, one of the country's most popular teams. While the league is still hoping for an annual total attendance of more than 8 million, the signs have been worrying. "We have to admit that the popularity and the performance level of baseball has stagnated for the last few years," said Yoo. A series of small but niggling scandals has not helped. Last November, two professional pitchers were charged by police with deliberately walking batters -- throwing four pitches outside the strike zone and allowing the batter to get on base without touching the ball -- in return for cash payments. Four of the clubs in the league have also admitted paying money to an umpire in 2012 and 2013. Doosan Bears president Kim Seung-young resigned in July, while employees from Kia Tigers, Samsung Lions and Nexen Heroes have been questioned by public prosecutors. "Gambling scandals by players and money-lending to umpires will probably begin to slow the [sport's] growth and popularity," said Kurtz. "These scandals only hurt the reputation of the league around the world." Such negative publicity makes the success of the national team all the more important. "2020 Tokyo Olympics can serve to be another great opportunity to reignite this passion that's fading away," said Yoo. "We're hoping that Tokyo in 2020 will be like Beijing in 2008."